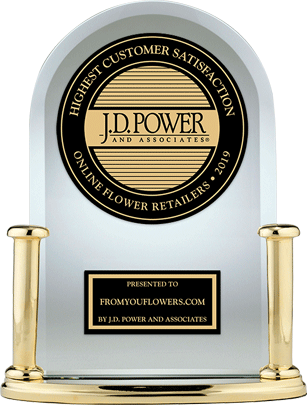 From You Flowers is proud to announce that we are the recipients of the 2019 award for the "Highest Customer Satisfaction with Online Flower Retailers" given by J.D. Power and Associates. All of us at From You Flowers are dedicated to providing customer service that goes above and beyond. Every time our customers choose us to help them celebrate a special occasion, we are focused on making their gifting experience with From You Flowers one to remember. Our team has put in a lot of hard work throughout the years to ensure our customer service is top-notch, whether you reach out to us via email or phone we are always here to help you place an order or answer any question you may have. Thank you to J.D. Power and Associates for granting us the "Highest Customer Satisfaction with Online Flower Retailers" award for 2019 and a special thank you to our customers, we could not have done this without you.